Rediff.com » Business » Who will be the next SBI chief? 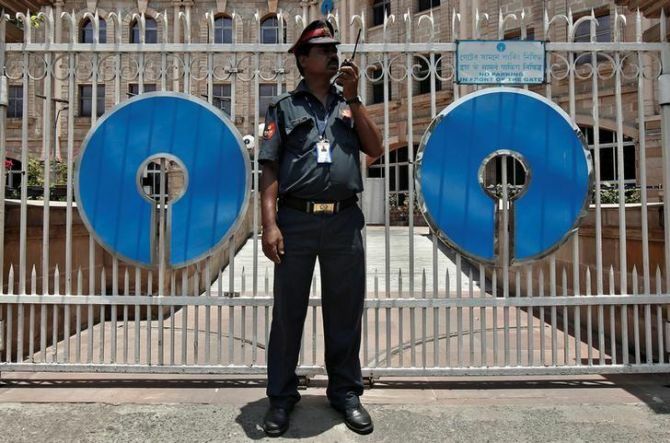 Who will be the next SBI chief? State Bank of India chief Arundhati Bhattacharya will hang up her boots on Friday on completion of her term. But, there is little clarity on who will succeed her, especially at a time when India’s largest lender is in the midst of a transition - the merger of its associate banks. The Banks Board Bureau (BBB) had interviewed four managing directors for the post at the end of June and had recommended a name to the government. The BBB, however, did not put the name of the recommended person on its website. Another crucial post that remains vacant is that of a deputy governor at the Reserve Bank of India (RBI). Conventionally, a senior commercial banker is picked for the post, who predominantly focuses on supervision of financial sector players. S S Mundra, who worked in this capacity, retired at the end of July. The government has conducted interviews but is yet to announce a name for this post. Last year, the government had extended Bhattacharya’s tenure for a year, with effect from October 7, 2016. B Sriram, the senior-most managing director at SBI, along with fellow MDs Rajnish Kumar, P K Gupta, and Dinesh Kumar Khara had been interviewed by the BBB. Of them, Gupta and Khara have relatively longer tenures left with the bank. Both Kumar and Sriram are due to retire in 2018. Bankers said SBI has been without a full-time chairman in the past as well. After A K Purwar retired in 2006, Tara Shankar Bhattacharya, an MD with the bank, was made the chairman in-charge for one month. Then, O P Bhatt became full-time chairman for a five-year period. After Bhatt retired in 2011, the interim charge of the bank was given to R Sridharan, another MD. Then, Pratip Chaudhuri was appointed full-time chairman. The lender’s performance, especially its asset quality, suffered in the June quarter of FY18, partly due to the effects of the merger of associate banks, bankers said. Asset quality of the retail loan book (loans to individuals) came under pressure in April-June, as advances worth Rs 17,886 crore (Rs 178.86 billion) slipped into the category of non-performing assets (NPAs). Constraints on the follow-up for recoveries during transition to the merged entity and the end of forbearance on loans after demonetisation had impacted asset quality. Delays in appointment of chief executives for public sector banks is not new to this government, as was seen in the case of Bank of Baroda (BoB) and Indian Overseas Bank (IOB). BoB was without a full-time CEO since August 2014, till P S Jayakumar came on board in October 2015. The last full-time CMD at BoB was Mundra, who moved to the RBI in July 2014. After Mundra's exit, executive directors were handling operations. During that period BoB’s image had taken a beating due to alleged scams and an ongoing probe. Besides alleged "illegal transfers" of foreign exchange of over Rs 6,000 crore (Rs 60 billion) from a branch in Delhi, a Rs 350-crore (Rs 3.5 billion) bill discounting scam in Gujarat also hurt the bank’s reputation. Chennai-based IOB was without full-time chief executive for many months in 2016 at a time when the public sector bank was saddled with a huge bad loan portfolio. It was already under the prompt corrective action plan.